Chelsea have been angered by the claims of Thibaut Courtois that director Marina Granovskaia reneged on promises over his future ahead of the goalkeeper’s controversial move to Real Madrid. As first revealed by Telegraph Sport in August, Courtois went AWOL and refused to return to pre-season training with Chelsea to force through his £35 million switch to Real. It has emerged that he first demanded a transfer last March, despite publicly announcing in the same month that he was committed to Chelsea and would continue to do his best. Chelsea even considered allowing Courtois to run down the final 12 months of his contract, but he reacted to the possibility by effectively going on strike – despite also suggesting on the record that he was prepared to respect his deal. 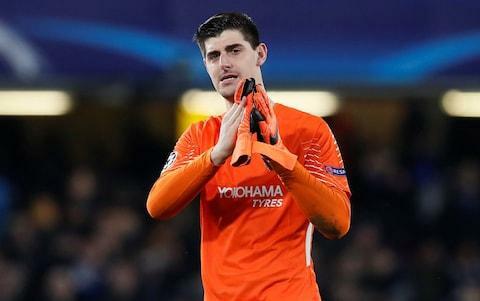 Courtois tried to justify his actions at the weekend by claiming Granovskaia attempted to back out of a pre-World Cup agreement that he could leave Stamford Bridge. Chelsea sources strongly reject this suggestion and his version of events, and Courtois can expect a frosty reception from his former club and its fans if he ever has to return with Real. It is understood that Chelsea’s versions of events are that, despite offering to make him the best-paid goalkeeper in the world, Courtois informed the club of his desire to leave in March. The Blues responded by telling Courtois they would start to consider potential replacements and he may be allowed to go if they could identify the right man and received a bid they were happy with and that would satisfy his demands. Chelsea suspected that interested clubs at that time were willing to wait for him to run down his contract and leave on a free transfer and in June his agent informed the club that there was no concrete interest from a club wanting to buy him. Following a good World Cup, Real Madrid stepped up their interest in Courtois, but did not immediately make a bid. By the time an offer was made, time was running out in the transfer window and Chelsea informed the Belgian that it could be difficult to let him go and they would accept him running down his deal. Chelsea again reject the explanation of Courtois that “suddenly after the World Cup, a departure wasn’t that obvious anymore. All possible targets seemed too expensive. That was not what we had agreed on”. It was at this point that the Blues reiterated their preference for Courtois to stay and sign a new contract. But he refused and did not return to pre-season training, making it clear he would not play for the club again. Not wanting to risk the harmony of his dressing-room during his first pre-season in charge, head coach Maurizio Sarri recommended that Courtois was sold and Chelsea quickly made progress on the signing of Kepa Arrizabalaga. Chelsea have been delighted with the form of Kepa, who has kept 11 Premier League clean sheets so far this season which is only two fewer than Liverpool’s Alisson Becker. Courtois joined Chelsea in 2011 and spent three seasons on loan at Atletico Madrid during his seven years as a Blues player. He won two Premier League titles, the FA Cup and the League Cup with the club.